It's the leader of the pack! Alpacas that is, we got a call of wandering alpacas exploring Hope Ranch. Officer Youngblood and animal control stopped the fluffy group of animals. 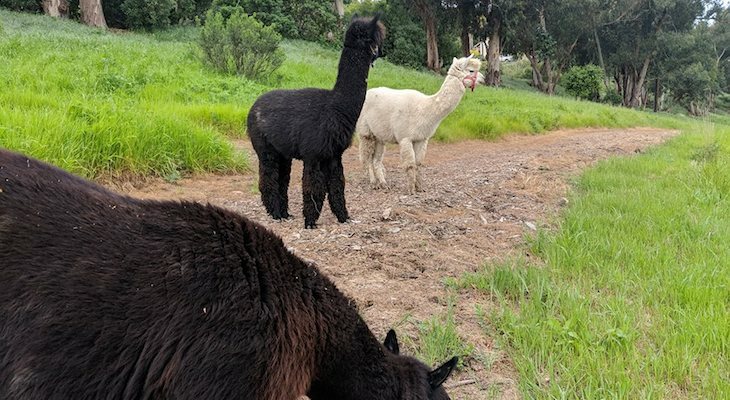 The animal control employee had knowledge that alpacas are pack animals. She related if you catch one the others will follow. As a team they gently placed a rope around one of the alpacas. 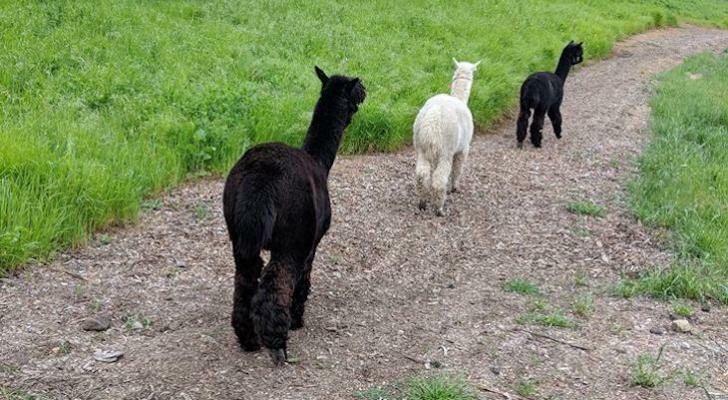 They started walking towards ranch properties and were contacted by the owner of the alpacas. No alapacas were hurt and everyone was happy. Great job Officer Youngblood and Santa Barbara County Animal Services. Officer Youngblood is a champ! I see many vagrants and travelers with packs on. Could this strategy work on these stray animals as well? I thought the banta were a mythical creature from Star Wars - I guess I was wrong. Darling animals, glad they got home together. "GRASS THIEVES NABBED BY LOCAL LAW ENFORCEMENT!" where in Hope Ranch ? Next to Modoc Rd near VV school. Adorable! This is a very good outcome. Good thing the mountain lion wasn't wandering in the same neighborhood. Cool that these fluffburgers got a bit of a walkabout. Glad they're unharmed. Who left open the gate? This would have been a great story on April Fools Day!